BOTTOM LINE: A one-man show weaving together historical events in the early 1900s with a boy's love of Houdini in Newport, South Wales. It's not easy to create an entire universe by yourself. Sharing that universe with others is exponentially more difficult. As the writer and performer of A Regular Little Houdini, Daniel Llewelyn-Williams does just this. The stage is bare. The walls are black. The room fits no more than 60 people—if you have been in 59E59's Theater C, you know how intimate the space is. There is no way to successfully put on a production without engaging the audience, which is why Llewelyn-Williams' only choice is to exist within his world completely and share it with those sitting around him. There is no set. We don't have a narrator. All of the onus is on this gentleman to entertain. “Entertaining” is quite subjective—not everyone seeks the same kind. If you are looking for a flashy production, this is not it. If you want flowery language, you might want to reconsider. If you want to see an extremely talented performer with attention to detail, the ability to switch characters excellently, and a penchant for magic, this is precisely your cup of tea. Llewelyn-Williams takes us through the young life of a boy in Newport, South Wales in the early 1900s. He is a precocious, determined, and genuine child who lives in a house with 10 people— his parents, siblings, great aunt, and grandparents. Being poor is never easy, but they are rich with love. Though his father is busy supporting the family as a dockworker, the boy has a special relationship with this Gami (grandfather). But what motivates this child is magic. His passion stems from book about Harry Houdini from his father, and a pair of keyless handcuffs from his Gami. Wanting to become a rich and famous “self liberator," like Houdini, the boy falls asleep every night trying to pick Gami's handcuffs. During the day he practices his version of Houdini's Chinese Water Torture Cell in a sewer pipe with his friend holding him down. As he develops this character, Llewelyn-Williams weaves in historical events, making it quite clear he has done his homework. The specificity of Harry Houdini's appearances, the creation of the Newport Transporter Bridge, and the Newport Docks Disaster are all important events within this show and this young man's life. Not only are they the foundation for each plot point, they help ground the magic in reality. History comes alive in A Regular Little Houdini—if you have the time before the end of the year, check out Daniel Llewelyn-Williams' one-man show. 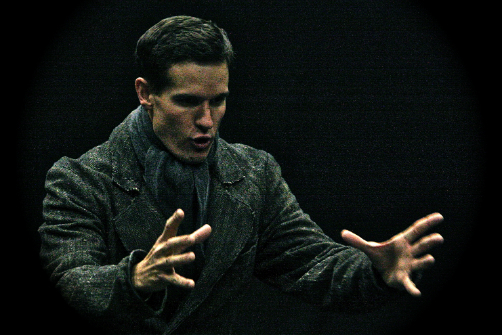 A Regular Little Houdini is written and performed by Daniel Llewelyn-Williams. Directed by Joshua Richards. Composer is Meg Cox. Magic tricks by Adrian Solar and Tom Silburn.